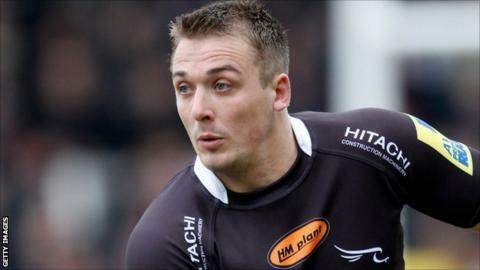 Newcastle outside back Lee Smith has said there is no issue with former club London Wasps prior to his first return to Adams Park on Saturday. Smith, 27, left Leeds Rhinos in rugby league for a switch of codes to join the Premiership club in 2009. But injury and personal reasons led to his return to the Rhinos after just five months and two first-team games. "I've got nothing against Wasps at all, I enjoyed my time there," Smith told BBC Sport. "I got down there coming off the back of not having a pre-season, more or less got chucked straight in and I unfortunately got an injury - a bulging disc in my back - and I didn't get off to the best of starts, which was frustrating. "I don't regret it, I think it was good and I learned a lot. I moved to London and enjoyed my time down there and met some very good people." At the time of the move to Wasps, Morley-born Smith was one of the league code's hottest properties. He picked up the Harry Sunderland Trophy for man of the match as the Rhinos beat St Helens in the 2008 Super League Grand Final at Old Trafford, and then scored two tries in the following year's repeat final on his last appearance. The Drighlington amateur was also an emerging international player with seven tries in eight England games, used to playing regular football at domestic level. "I think it was just a bad decision on my behalf. I was young, only 22 years old and it probably wasn't the right decision for me and Wasps," Smith continued. "I was a young kid and I just wanted to play rugby, that's all I wanted to do but they saw the bigger plan, which was to bed me in and have me more for the year after as I'd signed a three-year deal. "Looking back I was doing it day-by-day, rather than looking at the bigger picture - ultimately that was what it was. When you're caught up in it as a young kid and all you want to do is play rugby, you can't fault me for that. "I think Wasps saw that too, that I just wanted to be playing. We left on fairly good terms, they were happy enough to part company with me." in February on the back of a spell at Super League side Wakefield. Director of rugby Dean Richards has handed Smith three first-team appearances to date.